Spare yet never lacking, these breathless poems capture the beauty of the simple and the sacred. 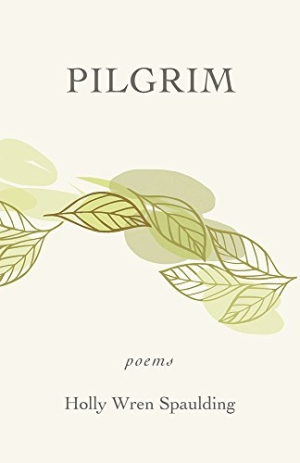 Holly Wren Spaulding’s Pilgrim is as nourishing as breath. The importance of each line, each word, is equal to that of the spaces in between them: how the sky comes through the branch of a tree without leaves. The speaker’s depictions of the natural world are both universal and intensely personal. Pieces like “Pilgrim” and “Late and Soon” share experiences with time and season alongside images of everyday love—making soup, stacks of quilts, desire. The result is a deep sense of care for each thing that turns the journey of the collection into a pilgrimage itself: the “brittle / tannic smoke” is sacred; the trees “draped bride-like” are sacred. The epigraph by Japanese poet Basho places Spaulding’s pieces within a context that is both open and quiet: breath comes in and breath comes out; words capture beauty, experience, time; and then there must be openness that allows these to be—to question “from where, / which tree?” and to see the sky as well.